It was October, a new month and time for another wedding. For these nuptials, instead of the hills of Charlottesville, Virginia, I had flown to Boston and braved the Massachusetts turnpike to make it to the hub of western civilization that is known as western Mass. That may be misconstrued as a factious remark, but for years I’ve been told by a few of my friends, I’m looking at you, McD and Lisa, that all that is good and great in this world begins in the western half of their home state. So, nearly seven years after the first mention, I had made it. Of course, now that I was actually in Springfield, it had to figure out what to do with myself. Like any well equipped wedding planners, Mike and Katie had included a few suggested restaurants and points of interests for their guests. While I did take advantage of the basketball hall of fame, the Norman Rockwell museum was too far so I figured lunch was the next best thing. This leads back to my pre-trip research where it seemed that, no matter which website, blog, or messageboard I checked, the center of Springfield was The Student Prince. After a rehearsal dinner the night before and a tour of the hall of fame the next morning, Bill and I left the hotel and made our way to Fort Street and The Student Prince. A few cups of coffee, a missed turn, one parking job and one entry into the wrong restaurant later, we were seated at the bar with a mug of beer and a menu in front of each of us. 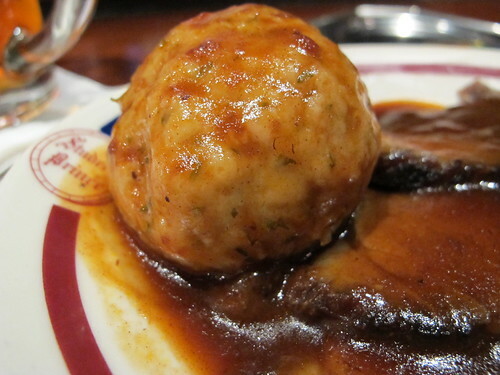 While taking in the variety of German knickknacks and kitsch in The Student Prince, the first dish arrived. 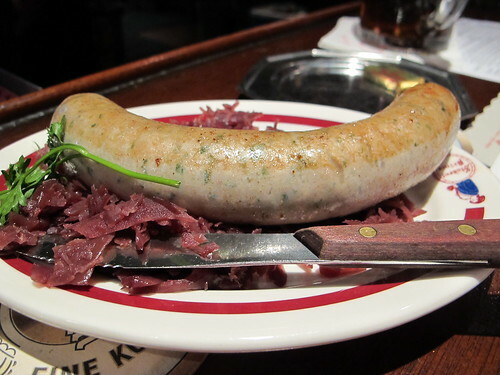 Per our waitress, the weisswurst was the best homemade sausage at The Student Prince, and with a silky smooth, green onion speckled filling, it was a precocious start. 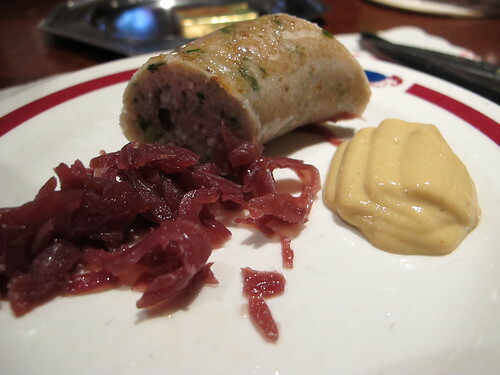 To compliment the weisswurst, there was a helping of tart, crunchy sauerkraut. In fact, the only disappointing part about this sausage was the mustard. It seems odd that The Student Prince would take the time to make the sausage but spoil it with plain grey poupon mustard. Three slices of marinated and braised beef with a rounded scoop of potato and plenty of cabbage. The sauerbraten was fall apart tender, but it had a very dry texture that was only saved by the liberal application of the sweet and sour sauce. 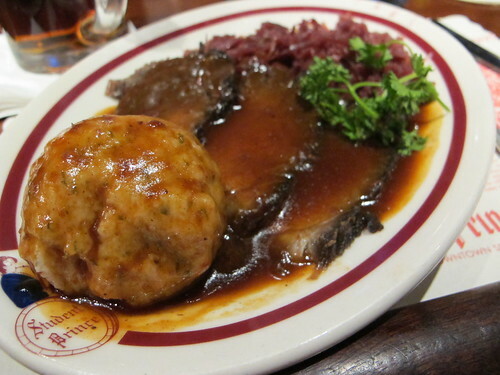 If you’re looking for stick to your ribs density, look no further than the potato dumpling that accompanied the sauerbraten. Covered in sauce, it shimmered in the light. 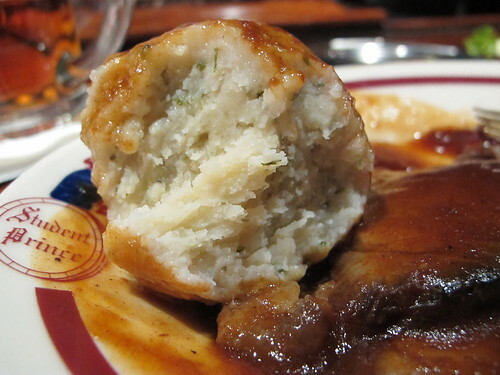 Seriously, this dumpling was unbelievably thick and relatively flavorless on its own but not too bad when combined with the sauerbraten and its sauce. There you have it, a whirlwind, two stop tour of The Student Prince menu, and what’s the verdict? If this is the best that Springfield has to offer, I’m much underwhelmed. 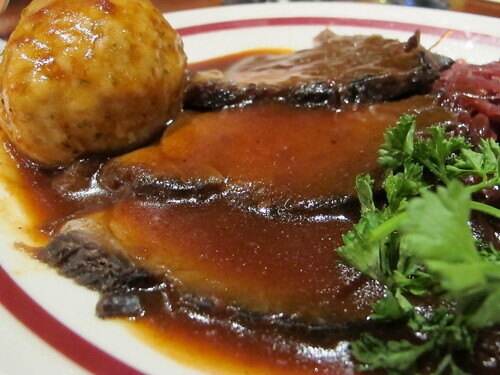 Yes, the weisswurst was a nice touch, but the sauerbraten and its dryness left a lot to be desired. I suppose if I do make it back to Springfield and to The Student Prince, I’ll stick to the sausage and beer, but please….hold the mustard. The Student Prince is absolutely NOT the best Springfield has to offer. There are several restaurants about the city that are considerably better. Theodore's for one, Currents is another, and I enjoy Max's Tavern quite a bit and that is in the same building as the basket ball hall of fame. If you come back, try one of these! Holyoke (10 miles away) has The Mick which I find to be the best in all of Western MA. -Thanks for the suggestions, I wish I had known about them when I was there. But if I do make it back to Springfield, I'll be sure to give them a try.